Kid is one of the leading martial arts writers in the world. His deep technical knowledge comes from years of personal tutelage, first under Rickson Gracie and then Royler Gracie, under which he currently holds a 3rd degree black belt. For this app Kid selected what he believes are some of the most important concepts and finishing techniques including some never seen before "special" Kid Peligro variations that will super-charge your closed guard. Learn how to break your opponent down and take advantage of his weaknesses with your new found knowledge. Learn how to escape and survive these situations. Frustrate your opponents as you escape from their attacks with ease and technique. Take advantage of their frustration and turn it into your weapon. A must have for anyone training! 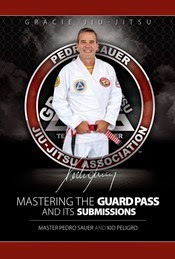 In this app Kid explores the secrets and thoughts that will make passing the guard easier and more effective for you. Going deep into his experience and knowledge base Kid lays it all out in his usual detailed and thoughtful way of explaining the techniques and thoughts that you need to have to became a great guard passer! Passing the guard is one of the most important parts of Brazilian Jiu-Jitsu and for self-defense. Kid Peligro showcases some of his favorite guard passes and goes beyond that, explaining what you should be thinking and how to proceed to make you an effective guard passer. In addition to the techniques, Kid explains several details that will turn you from a lightweight into a very strong guard passer. Learn how to take advantage of opportunities and how to avoid traps that your opponent sets up. Learn the mindset that you need to become a great guard passer and how to make your opponent wish he wasn't fighting you. Side control is one of the most important positions in Brazilian Jiu-Jitsu and street self-defense. After you've passed the opponent's guard and has reached this very desirable position the last thing you want is to lose it. Kid Peligro goes in great details of explaining how to control the opponent and defuse any of his attempts to escape. He then goes on to show his favorite submission attacks. This app going way beyond just the killer techniques, as Peligro goes on to explain what you should be thinking and how to proceed to not only control your opponent but also to submit him. Additionally, Kid explains several details and nuances that will completely change your perspective on the position and will turn you from a lightweight into a very strong Jiu-Jitsu fighter. Learn how to take advantage of opportunities and how to avoid the pitfalls of the side-control position. Learn the mindset that you need to become a dangerous submission artist and how to apply pressure and control so your opponent wish he wasn't fighting you. Kid Peligro releases his new ebook: "Brazilian Jiu-Jitsu Secrets of the closed Guard - Vol.1"
The book compliments his highly successful Iphone app: "Secrets of the Closed Guard" and has all the techniques of the app plus. With detailed instructions, hundreds of color pictures to illustrate over 40 techniques and variations so anyone can turbo-charge their guard.